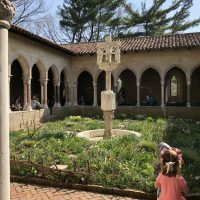 When we were asked to visit the cloisters, I had no idea where it was and what it was. It seemed like everyone in the class knew of the cloisters except for me. Looking on Google maps made me refuse to go due to the commute to upper Manhattan. Although, I ended going there on the very sunny day, I went in without any expectations and it surprised me with many lavish artifacts. This was the first time where I felt intrigued by the objects inside because of its’ setting. There were dim lights which made the artifacts stood out and captivating. 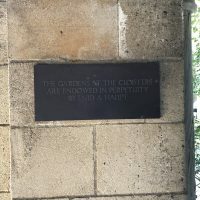 The location of the Cloisters reminded me of being in a park which made the whole experience different because I had to find the correct route to the entrance and also the big grass areas made it feel and look like a park. The cloisters compared to The Met on 5th Avenue had different sensations. In other words, The Met museum is so prodigious that one will get overwhelmed by which section to look first. It is spacious and modern which satisfies the tourists and students. 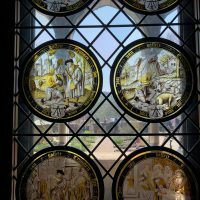 Unlike the cloisters, it gives a warm and suspicious feeling when you browse through the museum. Given the garden outside, it seemed casual and appealing to the visitors. The section where they stored the stone and marble statues felt very open because there was no protection around the objects. I was able to look very closely at the statues. A few of the statues were touched over and over again from past visitors that was why the statues faces faded over time. From my perspective, I prefer going to the cloisters because I enjoy the atmosphere and European style museums. The garden was a highlight of the trip because it did not make me feel like I was forced to go to a museum. It was nice to take a break from roaming room to room. 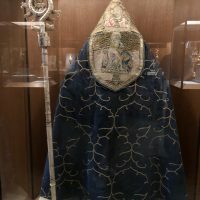 The object I came across, was the Crozier. It stood out to me because it had a sense of powerlessness and dominance in the room. During the 14th century, the pastoral staff (crozier) was based on the shepherd’s crook that was carried by abbots, abbesses, and bishops. It was north Italian, bone and paint, and classified as Ivories-Bone. 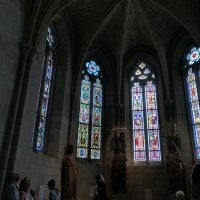 In the center, there was a form of the Holy Lamb and the black, red, and gold painted leaf decorations that represent the final Gothic stylized patterns. This was flourished in Sicily and Italy in the 12th century. The three sections have already been damaged but was repaired and are no longer separable. The crozier was originally made in sections with threaded ends. It was announced that the there was the fourth section but it was missing. I chose this artifact because it had a resemblance to the Chinese Ruyi Jingu Band from the Journey to the West novel. The magical wand was used by Sun WuKong, it may be transformed into thick, thin, long and short mostly used during his fights. I referred to this character because it the crozier was placed next to the cope which reminded me of the Chinese emperors. This object was interesting to learn about because of the unique shape on the top. Usually the staffs would look like a wooden stick but in this case, it has exaggerated details and constructed in a different shape. 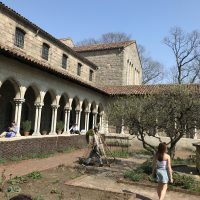 Overall, the visit to the cloisters was definitely one of the highlights of this objects as history class because unlike the other museum visit, they felt repetitive and monotonous. 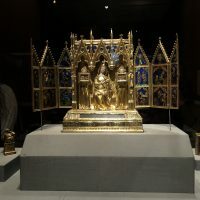 As a result of the class discussion, it seemed like the majority of the class enjoyed the trip although the commute took a long time for me to reach, I was able to experience and differentiate the impressions of the various styles of The Met.